The motor pinion gear, rear axle gear, the rear axle bearings and the motor bearings of your Scalextric, SCX and slot cars must be lubricated from time to time to ensure top performance when your slot cars go racing. Wear and gear noise is also reduced with the occasional application of this oil and grease. Please refer to the service sheet supplied with your slot car to determine the exact points that need lubrication. We may also be able to supply a service sheet for your Scalextric car. The grease colour may vary from that shown. This lubrication kit is suitable for all slot cars; Artin, Ninco, SCX, Scalextric, SCX Scalextric, Tri-ang and many more. 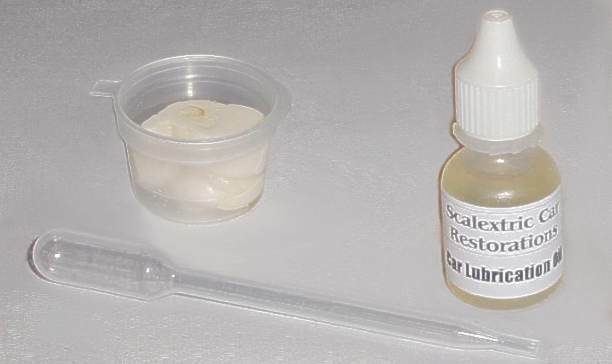 If you are not sure how to use this lubrication kit on your Scalextric slot car then please contact us we can help you.